Receive all the advice you need from the market leader and develop a customised concept together. We’ll be more than happy to help! Turn your vision of a healthy snack into reality. We’ve a large selection of existing recipes – both organic and conventional. We’ll also be happy to develop new recipes with you in line with your wishes. And we’ll also offer you all the packaging options for your bars – thus catering for all your POS needs. Schock is able to draw on many years of experience in the private label sector. We’re committed to developing marketable products with our customers that will thrill consumers. We’re open to new ideas and use all our know-howto realize them. We’re a competent, loyal and reliable partner with a wealth of experience at our disposal to answer your questions whenever you need us. Peanuts, pumpkin seeds, sesame, almonds, cashews, hazelnuts, chia seeds, linseed, etc. Goji berries, raisins, cranberries, physalis, sour cherries, figs, apricots, etc. Honey, agave nectar, brown rice syrup, etc. Millet, hemp, spices, cacao nibs, etc. Private label, but how does it work? 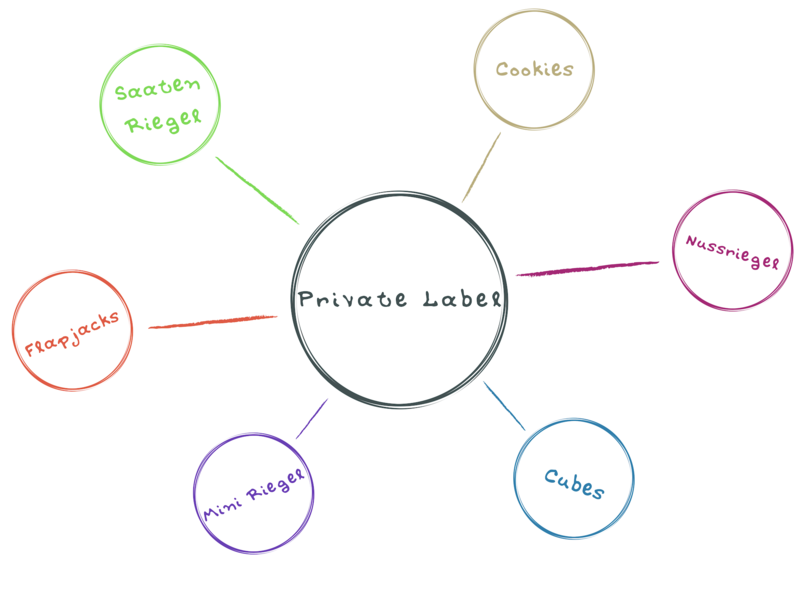 What are the requirements for a private label? Do you have an idea? Then speak to usand let us draw up some plans together! What format does the working relationship have? One that’s as simple and as uncomplicated as possible! Direct communication is very important, hence you’ll be working in close cooperation with your customer advisor. Total reliability, product safety and trust. Quality coupled with creativity, know-how from decades of experience and the constant search for new ideas – that’s what sets us apart. How flexible is Schock’s regarding MOQ? We have a soft spot for start-ups and even make it possible for individual creations in small quantities to come tolife. Flexibility is our major strength. Can we design our own products? We’ll do everything to turn your visions– whatever they are – into reality. Our product design coordinators and our own development department are on hand to put your ideas to the test under real-life production conditions. Almost everything is possible! What you see is what you get. That’s our motto. We only work with the best natural ingredients. You won’t find things like dyes, preservatives, aromas,flavour enhancers, etc. in our bars.